A perfect gift for the holidays... this Sanata created by Lladro in 1993 is being featured for the 2006 Christmas season at only $300 more than its 1996 last retail. 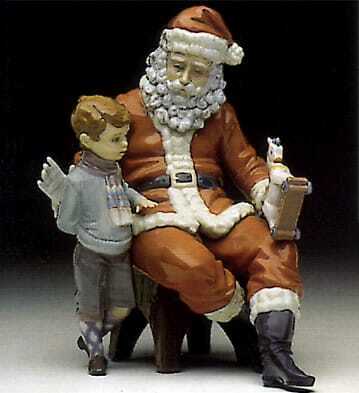 Click LINK below to view all Santas by Lladro or other Christmas / Hanukkah gift ideas. "G" or "M" after a model number in a catalog listing - what does that mean? Most figurines produced prior to 1991 were available in either glazed (G) or unglazed matte (M) finish, both from the same mold and using the same porcelain formula. Some collectors prefer only one style or the other, and some even prefer to have one of each to make an interesting side by side set. It is strictly a matter of personal preference. Any price difference is strictly due to supply and demand. More recently, Lladró has designated matte and Gres pieces with a "one" prefix (e.g., #11011 for #1011) and glazed pieces with a zero prefix (e.g., #01011 for #1011). The figurine pictured is Lladró #01011036 Horsewoman in "matte" finish.